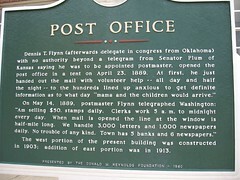 Dennis T. Flynn (afterwards delegate in congress from Oklahoma) with no authority beyond a telegram from Senator Plum of Kansas saying he was to be appointed postmaster, opened the post office in a tent on April 23, 1889. At first, he just handed out the mail with volunteer help - - all day and half the night - - to the hundreds lined up anxious to get definite information as to what day "mama and the children would arrive." On May 14, 1889, postmaster Flynn telegraphed Washington: "Am selling $50. stamps daily. Clerks work 5 a. m. to midnight every day. When mail is opened the line at the window is half-mile long. We handle 3,000 letters and 1,000 newspapers daily. No trouble of any kind. Town has 5 banks and 6 newspapers." The west portion of the present building was constructed in 1903: addition of east portion was in 1913.